Dedicated to providing delicious and authentic Italian food since 1999, Zizzi's is the perfect place to come for that memorable meal out. Whether you want to tuck into a fresh and tempting pizza over a glass of wine with friends or enjoy a romantic three course meal with that special someone, Zizzi offers are a great way to treat yourself for less. With the latest Zizzi voucher always promising a fantastic deal, there's no excuse not to visit your local Zizzi! Founded in 1999, Zizzi is a popular chain of Italian restaurants with premises across the United Kingdom. The owners Gondola Group are the experts in affordable Italian cuisine, with both Ask and Pizza Express restaurants also under their belt, and they currently operate 126 Zizzi restaurants throughout the country. The latest addition to their portfolio is the flagship Zizzi store in Glasgow's stunning Royal Exchange Square, which opened in February 2013. The company's name (pronounced 'zeetzee') derives from the Sicilian dialect term 'zizzu' meaning 'stylish youth' – a term which reflects the fun, youthful and informal attitude to dining that can be found throughout Zizzi's restaurants. Funky, contemporary interiors provide a popular backdrop for customers enjoying everything from afterwork drinks to family reunions, and the open plan kitchens and large masonry ovens that are a feature of many of the restaurants provide a fun focal point for diners. The menu at Zizzi's restaurants is fresh, diverse and exciting, with familiar Italian favourites such as pasta and pizza featuring alongside more unusual meat, fish and vegetarian dishes to create a selection that offers something to suit every budget and taste. Through a simple and uncomplicated approach to cooking, Zizzi captures the essence of no-fuss, delicious Italian food and serves it up to delighted diners across the country. Zizzi is also commited to raising money for charity, with the pioneering 'Pennies with Zizzi' electronic charity box project raising over £50,000 for charity fo far. Now customers who love Zizzi's blend of affordable, quality food in a fun and inviting environment can enjoy their favourite food for less with a Zizzi voucher. Whether you're celebrating a special occasion or just catching up with friends, Zizzi voucher codes are a great way to treat yourself for less. Browse our website to find a Zizzi voucher code that suits you. Follow the instructions on our website to activate the voucher. Print your voucher out and take it along to your nearest Zizzi restaurant. Simple right? So grab your voucher, find the Zizzi nearest you, and start eating more of their delicious Italian food and cuisine for less! Your stomach, and your wallet will thank you! Want to know what it's like behind the scenes at your local Zizzi restaurant? Why not follow the Zizziristorante Youtube channel? Packed full with excellent content, the Youtube channel gives you the chance to find out more about your favourite recipes, see chefs at work, get access to exclusive Zizzi vouchers and more. The selection at Zizzi is so diverse and varied that even the fussiest of eaters is sure to find something to whet their appetite, whether it's a traditional Lasagne al Forno or Margherita Pizza or something more unusual like a Primavera Pizza with artichokes and goat's cheese or pan-fried salmon with slow roasted tomatoes and capers. And now that you can save money with the latest Zizzi voucher, there's no excuse not to treat yourself and your stomach to a fantastic meal out! True bargain-hunters always scour for Ask Italian voucher codes in Food & Drinks category. If you cannot find any appropriate offer, check the coupons for Bella Italia, Cafe Rouge, Pizza Express purchases! Check if there are any time or date restrictions on your voucher before planning your meal. Telephone your nearest Zizzi restaurant or visit their website to reserve a table. Don't forget to let them know that you'll be using your Zizzi discount voucher! Bring your Zizzi vouchers along to your meal and enjoy great savings on delicious Zizzi food. 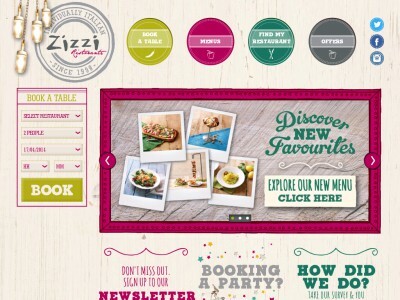 Want to get in touch with the team at Zizzi? Whether you want to find out more about saving money with a Zizzi voucher or talk to the customer service team about any issues you might have, you can contact them by telephoning 0845 6022698 or filling in the online contact form here. Want to keep abreast with all the latest developments behind the scenes at Zizzi? Why not follow their profile on all your favourite social media sites? You can find out about the latest Zizzi offers, discover seasonal Zizzi dishes, enter competitions and more across some of the most popular social media platforms. Don't forget to keep checking them regularly – you never know when the next mouthwatering Zizzi discount vouchers will be released so you can make great savings on dining out with family and friends. Buy now online at www.zizzi.co.uk/. Who doesn't love Italian food? I know I do! That’s why I’m such a fan of Zizzi.co.uk, and it’s not only because of the food, but also the savings! I used a Zizzi voucher on an amazing Rigatoni Carbonara dish the last time I was there, which significantly lowered the price of my bill. Zizzi offers a huge variety of dishes that you can save on by using a Zizzi voucher, and as they are free for you to use, is there any reason not to use one? So next time you want a taste of Italian, be sure to redeem your Zizzi vouchers before you head out!